Miami Spa Month is an annual event where top-notch resort and hotel spas offer spa treatments starting at $109 during the months of July and August. Treatments are up to 50 percent off during these special months at participating spas. In the past, participating hotels included The Betsy-South Beach, Mondrian South Beach, Delano South Beach, The Setai and Nautilus, a SIXTY Hotel. It's a great opportunity to check out lavish hotel spas where treatments are usually much more expensive. The nice thing is that you get access to their beautiful spa facilities, pool, and even beaches, so you can make a day of it. Miami Spa Month is sponsored by the Greater Miami Convention and Visitors Bureau as a way to lure tourists during the summer off-season, but it's a great deal for locals, too. There is no limit to the number of treatments you can get, and you actually have a few months because some spas offer them from July through September. It's a good idea to try treatments that complement each other like facial, a body treatment, and a massage (though it's hard to get too much massage). When tipping, consider the original price of the service and tip accordingly. Tax is also usually added. Wonder what kind of spa treatments they offered in past years? The Betsy’s Wellness Garden and Spa featured several treatments inspired by poetry, to fit in with the hotel's commitment to philanthropy, arts, culture, and education. A massage called "The Road Not Taken" is described as an "unconventional journey that connects the inner and outer worlds, the physical and the spiritual." The massage initiates from the feet up, focusing on the connective tissues and muscular paths between various parts of the body. The line of poetry that inspired the treatment is from Robert Frost: “I took the one less traveled by and that has made all the difference.” The only fully outdoor spa on Miami Beach, The Betsy's spa featuring unobstructed views of the Atlantic Ocean. Mondrian South Beach, which now has the GUYand GIRL Spa, at Mondrian South Beach offered a Deluxe Milk and Honey Manicure-Pedicure; a body scrub and massage combo called Body Bliss; a Rain Drop Facial + Collagen Eye Treatment; a facial and lavender body scrub combo called Revitalize; and Head In the Clouds, a 60-minute body massage with a 20 minutes scalp treatment. The Spa at The Setai by Themae offered a thirty-minute Asian Fusion Massage for Two with a complimentary Shimmering Dry Oil (30 ml); the Fresh Skin Ritual to promote skin radiance and renewal; the Themae Signature Massage; and an Aura Balance pedicure and Green Tea facial package. The aqua spa at Delano South Beach featured vinotherapy-inspired treatments, including a Grape Seed Scrub followed by a Vino Therapy Massage with a blueberry mask; a deep tissue massage with crushed grapeseed foot scrub and a grapeseed facial mask; a red wine facial with blueberry eye mask and grapeseed hand scrub; and a vinotherapy body treatment with a grapeseed facial mask and a rosemary scalp massage. 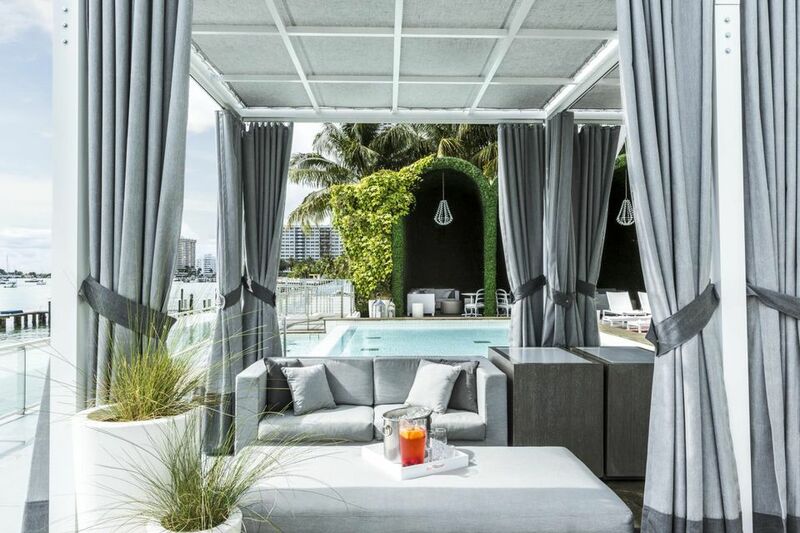 To find out which spas are participating in Miami Spa Month 2019, just go to Miami Spa Month starting on June 3, 2019. Select the spa you're interested in to see what treatments are offered. Once you decide on a spa and treatment, call the spa directly to make your reservation. The receptionist will ask for your credit card number to secure the reservation. Cancellation policies vary by spa, so check when you're booking your Miami Spa Month treatment. If you let them know 24-hours ahead that you need to cancel or reschedule, it shouldn't be a problem. If you cancel at the last minute or don't show up, you will be charged.